Library creation is often a tedious, time-consuming task requiring a high degree of manual effort for development and validation of required parts. Large pin count devices, now becoming the norm for most designs, are especially challenging and prone to error if automated processes are not employed. 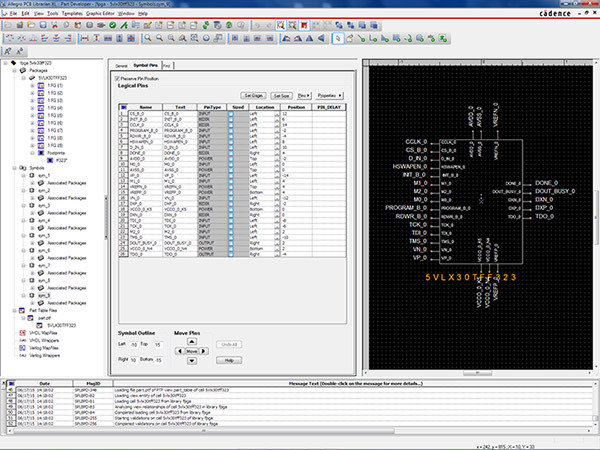 The Cadence® Allegro® PCB Librarian provides a powerful mix of functionality that includes the ability to quickly import and manipulate data, split pins across multiple symbols, and define visibility for power and ground pins. The capability to automatically manage, track, and save part versions while continuously recording differences removes the need for manual intervention and greatly increases accuracy during the part creation process. For companies who may have multiple EDA tool sets, Allegro PCB Librarian provides a single development environment and supports import/export of other EDA vendors’ library data in addition to common industry file formats. Part creation can be further accelerated by directly importing pin tables and pin grids, which can then be customized to meet company-specific standards. Finally, real-time validation and built-in rule checks at each stage of the part creation process ensures that schematic symbols and PCB footprints are always in sync. All of these capabilities are also an integral part of Allegro EDM and provide the foundation for a company requiring a larger scale library and design data management environment.